This October, Sotheby’s Modern and Contemporary African Art present a selection of exceptional works from across the African continent. The season’s sale will feature standout pieces by leading artist in this category, including Cheri Samba, Bodys Isek Kingelez, Ouattara Watts, El Anatsui, Marlene Dumas, David Goldblatt and Pascale Marthine Tayou. Sotheby’s has consistently achieved outstanding results for artists in this category. 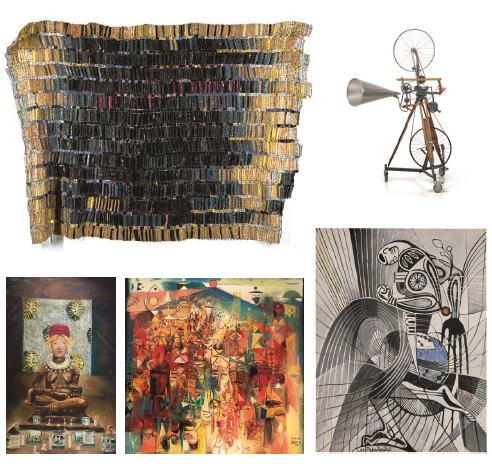 Since debuting in 2016, Sotheby’s Modern and Contemporary African Art sales have broken over 35 artists records and have attracted collectors from 33 different countries across 6 continents. Most recent sale saw over 50% of lots selling above their high estimate, most notable was Nigerian master Ben Enwonwu’s Africa Dances, which soared above its pre-sale estimate, realising £187,500/$265,744 (est. £20,000-30,000).